A low-cost tool designed by MIT will permit the diagnosis of lung diseases in remote areas or in developing countries without the need for access to more expensive laboratory equipment. Although mobile phones increasingly include features related to the monitoring of our health, such as the quality of our sleep or our heart rate, it’s still not the case that our doctor examines us using his or her smartphone. This may soon change. Thanks to their increased computing power, portability and ubiquity, smartphones are revolutionizing many areas and also have enormous potential for medical diagnosis, especially in remote areas or where economic resources are limited. 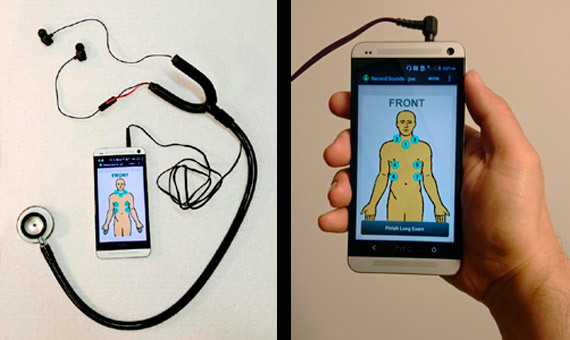 Following this philosophy, a team from the Massachusetts Institute of Technology (MIT) has developed and built the first “smart stethoscope”, a low cost device designed to work with an Android smartphone. Thanks to a specially designed app, the device becomes a much more powerful tool than the traditional diagnostic stethoscope and enables medical professionals to accurately detect lung diseases. According to the World Health Organization, approximately fourteen percent of all deaths globally are related to lung diseases such as pneumonia, chronic obstructive pulmonary disease (COPD) or lung cancer, and up to 7 million deaths a year are caused by air pollution. Other conditions, such as asthma, are not fatal but considerably reduce the quality of life. These diseases are a growing problem in developing countries due to the exposure of their inhabitants to risk factors such as air pollution in cities, the use of indoor fires for cooking or heating, or a reduced awareness of tobacco’s risks. Although there are many tools in modern hospitals for carrying out pulmonary examinations, this equipment is quite expensive and thus tends to be scarce in developing countries. This is the reason why MIT scientist Rich Fletcher and his graduate student Dan Chamberlain decided to develop a low cost diagnostic method. “We were very surprised when we found out that there are only a dozen laboratories with adequate equipment for diagnosing lung diseases across India,” said Fletcher. “Clearly the majority of the population is being diagnosed with rudimentary tools, resulting in erroneous or inadequate diagnoses,” he adds. The project was developed in collaboration with the Chest Research Foundation, a charity in India for research on lung diseases, and recently won third place in the Wireless Innovation Project Awards, designed to support the best innovations related to wireless technologies in the world, for which they will receive $ 100,000. With the prize money, the researchers have already announced that they will conduct an extensive clinical study in rural India over the next two years. The results of the diagnoses with the mobile platform will be compared with results obtained by experienced pneumologists using modern laboratory tools to analyze pulmonary functioning. The team has also entered into talks with medical industries in India that are interested in marketing and producing the device on a large-scale.